Episode 88 features Casey Taft. Casey Taft is Professor of Psychiatry at Boston University School of Medicine and focuses his research on the prevention of interpersonal violence. He has consulted with the United Nations and the domestic violence programs that he has developed are being utilized in the United States Department of Defense as well as the Veteran’s Health Administration. He’s also the co-owner of Vegan Publishers, understanding that working toward the prevention of violence done to other animal species follows naturally from working to end the violence humans do to each other. 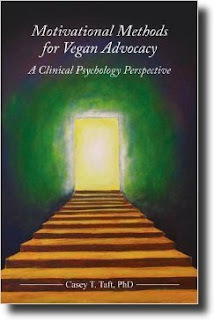 Professor Taft has published over one hundred journal articles and scientific reports, is the author of the upcoming book Trauma-Informed Treatment and Prevention of Intimate Partner Violence, and also the author of the recent book, Motivational Methods for Vegan Advocacy: A Clinical Psychology Perspective. Casey joins us today to talk about what advocates and activists may be able to learn from Clinical Psychology. Audio podcast, approx 32 mins.